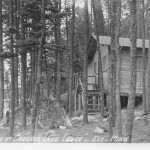 I recently received some old photographs of the Crooked Lake Fishing Camp, located in the boundary waters area near Ely, Minnesota. 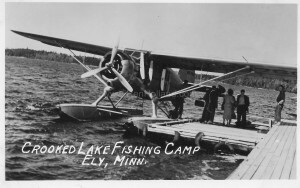 The camp was dependent primarily on float planes to transport tourists and supplies from Lake Shagawa, at Ely. 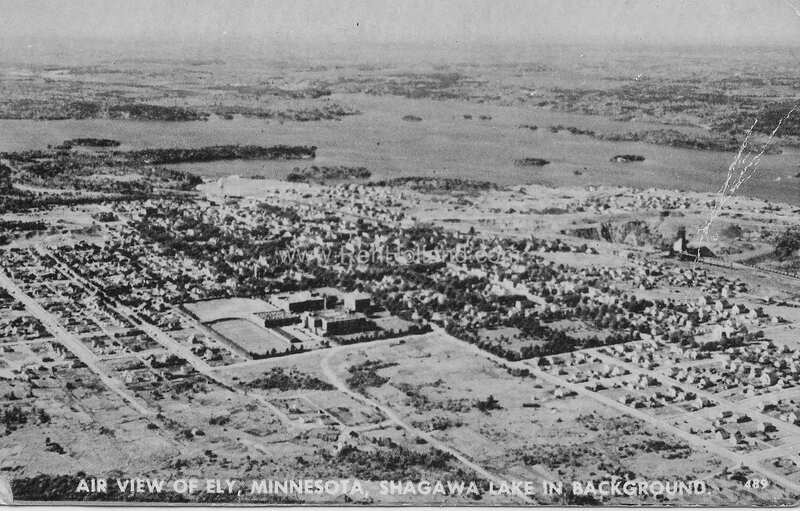 In looking up information on the camp, I found that it was once the epicenter of a controversy that still reverberates through parts of northeast Minnesota. Thanks to Jeff Limp, from Frankfort, Illinois, for donating the 1940s photos. Jeff and his family vacation in the Ely area. In the early 1940s, before the Boundary Waters Canoe Area Wilderness was created, Ely was considered the float plane capital of the nation.The area contained resorts, hunting and fishing camps, and private cabins. Motors were allowed, and there were three mechanized portages. Trucks with trailers were used to haul motorboats and canoes between lakes. Boats could be stored on wilderness lakes. 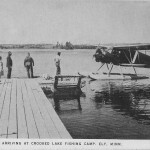 Twenty resorts were supplied by pontoon planes operating on Basswood, Knife, La Croix, Saganaga, Seagull, and Crooked lakes. 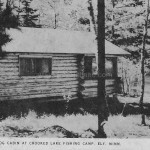 The Crooked Lake Fishing Camp was built in the 1940s by the Joe Perko family. 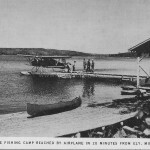 It took only twenty minutes to reach the camp by float plane on a direct route from Shagawa Lake, near downtown Ely. However, in 1948-49, the federal government passed laws to prevent airplanes from flying below four thousand feet above sea level over the wilderness areas. 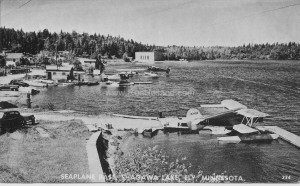 Since the Crooked Lake Fishing Camp was primarily reached by seaplanes, it was one of the first to be affected by the legislation. Several fly-in camp owners, including Joe Perko, resisted the federal government’s takeover of the privately held land, even though compensation was assured. With no air access to their resorts, they tried other ways, including roads and water, which were met with arrests and court action. In 1958, the area, which had been referred to as the Roadless Primitive Area, was renamed the Boundary Waters Canoe Area. 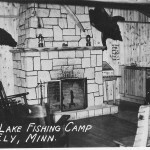 It wasn’t until 1965 that a final land exchange with the federal government officially ended the Crooked Lake Fishing Camp. 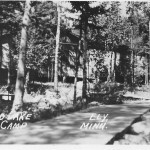 An account of the struggle to keep the camp open can be found in the Ely Echo Archives by clicking here. In 1978, after many years of opposition by many local residents, the area was designated an official wilderness. Motorized travel and logging ended on wilderness lakes when the U.S. Congress passed the BWCA Wilderness Act. This Act restricted logging, mining, and most motorized access on a 120 mile long, one-million acre wilderness. The BWCA was renamed the Boundary Waters Canoe Area Wilderness. Today, more than fifteen hundred miles of canoe routes and two thousand campsites exist in the BWCAW. It is managed by the Superior National Forest and is the largest wilderness preserve east of the Rocky Mountains. 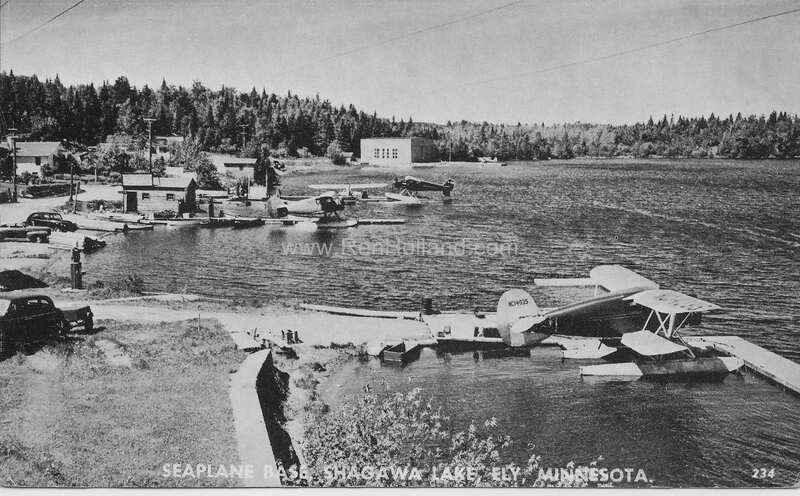 The U.S. Forest Service maintains a seaplane base on Shagawa Lake at Ely. It has the only airplanes authorized to fly in the wilderness areas. Three de Havilland Beaver float planes are used for emergencies, surveys, stocking fish, tree planting, and small fire suppression. Information on this unique floatplane base can be found by clicking here. 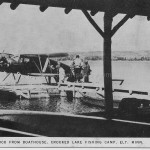 To hear a personal account of the early Crooked Lake Fishing Camp, click here to watch and listen to the YouTube presentation by Helen (Perko) Koski, who grew up at her father’s fly-in camp. 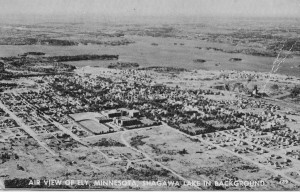 More information on other early Ely area resorts that were closed when the BWCAW was created can be found in my book, The Early Resorts of Minnesota. Another really interesting blog, Ren!